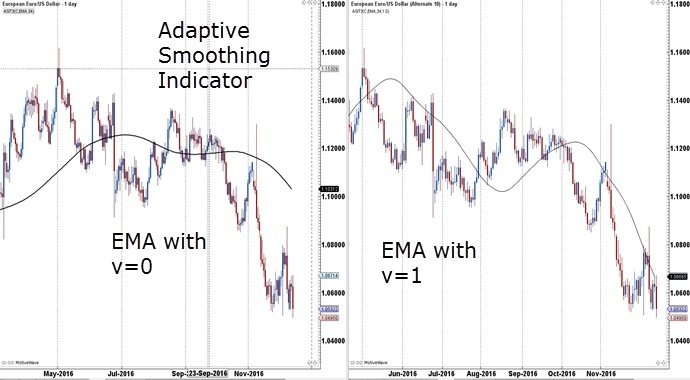 Adaptive Smoothing Indicator, or Tilson T3, is an adaptive moving average. The T3 combines a series of moving averages with a user defined volume factor. The user may change the input (close), method (EMA), period length and factor. On the MotiveWave platform, the input choices are Open, High, Low, Close, Midpoint, Typical Price and Weighted Price. The method choices include EMA (Exponential Moving Average), SMMA (Smoothed Moving Average), MEMA (Modified Exponential Moving Average), WMA (Weighted Moving Average), KAMA (Kaufman Adaptive Moving Average), DEMA (Double Exponential Moving Average), TEMA (Triple Exponential Moving Average), TMA (Triangular Moving Average) and VWMA (Volume-Weighted Moving Average). The volume factor is also a choice but the standard is .5. Finally, the period for the moving average must be selected. Start by putting in a 34-period EMA with a v of .5 on the close. The volume factor determines how aggressive the moving average’s response will be to the trend. The higher the v, the more aggressively the adaptive moving average will track price. If v = 0, the adaptive moving average is similar to an EMA. If v = 1, the adaptive moving average tracks like DEMA, the double exponential moving average. In the EUR/USD daily chart below, the magenta line is the 34 period EMA with v=0 and the blue line is the 34 period EMA with v=1. Some of the visible differences are described here. The magenta line looks more smoothed and the blue line has more peaks and valleys. The blue line gives more weight to recent price data and hugs price more than the magenta line. The blue is more reactive to price fluctuations, and the peaks are sharper and valleys deeper. Therefore, the blue line still looks like a moving average while tracking prices more aggressively. Traders may use the blue indicator to confirm market reversals. By using the blue EMA with v=1, the turning points are more visible and traders can look for breaks and then retests to enter the trend in the new direction. On the contrary, the magenta line where v=0 can be used to stay with the current trend longer, without getting stopped out unnecessarily. As with any indicator, observe the Adaptive Smoothing Indicator on several different markets and time frames to get comfortable with what it is telling you. See you next week for another “A” indicator! This entry was posted in Trading Tips and tagged Adaptive Smoothing indicator, fore<, forex trading, trading system.